Wise people (liberals) tell us that it is a sin to be parochial. We have no doubt that they mean well. The (bong) poet has said that under this (brown) skin, both Hindus and Muslims have the same red blood flowing in their veins (arteries). Personally speaking, we would be delighted to live in a world beyond parochialism but this is not what we have right now. Our policy is to tread the middle ground (as we see it). We celebrate identities but we do not approve of divisiveness. If that sounds weird, we are curious about your background but that is just because we do not know you. We have nothing to say about self-affixed labelings. If Barrack Obama counts his missing African dad to claim African-Americanship (while discounting the pale-ness of the maternal grand-parents who nurtured him) then we accept that at face value. As long as people respect the fundamental truths (but many do not) that (1) we all came from a village in East Africa (yes we know, hyperbole) and that the (2) culture in which you are raised will be a huge influence on you and that (3) discriminating against individuals solely based on their background (say caste or sect) is illogical and immoral, we can argue (non-violently) about everything else. That is a very long prelude to get to the topic at hand: we salute the South Indians who made the Mars Orbital Mission (MOM) a success. Before people get angry and accuse us of parochialism please see discussion above. There are countless groups in India which are subject to ridicule, derision, and even hate (women as a whole are probably the largest group to be so victimized) but it is the "South Indian" alone which causes maximum confusion. How does one go about defining an authentic South Indian? This not-so-original thought came to us during discussions with a "big man" woman. She is from Goa but she was having a go at South Indians. Thing is, for most of India, Goa would count as south!!! Perhaps as a (Gaud Saraswat) Brahmin she truly believes that GSBs originated on the banks of the Saraswati river in Punjab (see above for East Africa reference). But then most of the stereotyping about South Indians was pointed against southern Brahmins who have dominated the academies and bureaucracies in the North (after having been kicked out from the South). Perhaps a true South Indian is a Catholic fisherman from Kanya Kumari (the southern-most tip of mainland India) whose forefathers threw out a commemorative tablet glorifying the Hindu revivalist Swami Vivekananda into the ocean (Vivekananda Rock to them is St Xavier's Rock). Or she may be a follower of the Kalaignar (artist) Muthuvel Karunanidhi, who rejected his own (Sanskrit-origin) name Dakshina-murthy, who was associated with breaking idols of Ganesha (such activities are termed communal only when Hindutva-vadis inflict it on others) and who publicly declared Hindus to be thieves. He succeeded in persuading almost every State government to make a contribution towards the construction....even Nagaland and Arunachal Pradesh....."Leaders of every political party became willing partners of the Vivekananda Rock Memorial. The only Chief Minister who sent me back empty handed was the then Kerala Chief Minister Comrade EMS Namboodiripad. I can say this much about my abortive interview with him. It was like conversing with a sphinx. It was monologue all the way on my part. Only an empty stare from the other side!". This is the South India which has stood up against North India and the North Indian Party. But then this is also the South India where ISRO supremo K Radhakrishnan (also from Kerala) openly prays in (Hindu) temples so that the Mars Orbiter Mission is a success. These South Indians who presumably came up with the Sanskrit origin name of Mangal-Yaan. Then there is the inconvenient fact that a socialist, anti-superstition (read: Hindu practices) party that is loud and proud about its (non-Hindu) 5000 year old culture (or is it 50,000?) is being led by a super-caste, dictator-for-life who has added an extra "a" to her name due to advice from jyotishis (astrologers). Perhaps all of this adds up to the well known "pragmatic" nature of South Indians (as opposed to the allegedly violent, uncompromising Northies). But then we have the example of Lord Hanumana who is loved, respected...and even feared all over India, in idol as well as in living form. Without the violent, uncompromising (South Indian) Hanumana - as the Ramayana makes it clear - there would be no victory of good over evil. He is also the only known being who can fly around with his tail on fire. What better analogy for the Mars rocket do we have anyway? 1. K Radhakrishnan: He is the chairman of ISRO and secretary, department of space. The 65-year-old avionic engineer graduated in engineering from Kerala University in 1970. Radhakrishnan also has an MBA degree from IIM-Bangalore and he also got a doctorate from IIT-Kharagpur. Besides being a top space scientist, Radhakrishnan is an enthusiast of Kerala's classical art form Kathakali and a keen music lover. He received a Padma Bhushan in 2014. 2. M Annadurai: He is the programme director of Mars Orbiter Mission. Mylswamy Annadurai joined Isro in 1982 and was the project director for Chandrayaan I, Chandrayaan II, ASTROSTAT, Aditya -I and the Mars Obiter Mission. Annadurai and his works are mentioned in the 10th standard Science Text Book of Tamil Nadu. Born in Kodhawady near Pollachi in Coimbatore district of Tamil Nadu, Annadurai has been leading many Remote Sensing and Science missions at ISRO. 3. S Ramakrishnan: Director of Vikram Sarabhai Space Centre and Member Launch Authorisation Board. A senior ISRO scientist has more than four decades of experience in rocketry in the Indian space programme. Joined ISRO in the August of 1972 , Ramakrishnan played a key role in the development of PSLV which carried the Mangalyaan into the space. He had said, "From here to go to Mars we are going to use only a fraction of what we did in getting to the (Earth) orbit." The challenge for him was the launch of the rocket. He said the launch window was only five minutes. Ramakrishnan is a mechanical engineer from the College of Engineering, Guindy, Chennai. He received his M.Tech in Aerospace from IIT-Madras with the first rank. 4. SK Shivakumar: Director of ISRO Satellite Centre, Shivakumar joined ISRO in 1976. He was part of the team that developed the telemetry system for Chandrayaan-I, India's first lunar exploration mission. He also developed satellite technology and implemented satellite systems for scientific, technological and application missions. He said, "Our baby is up in the space. It was almost like a caesarean." 5. V Adimurthy: Born in Andhra Pradesh and educated at IIT-Kanpur, Adimurthy joined ISRO in 1973 and was the Mission Concept Designer of Mars Orbiter Mission. He was also awarded the Padma Shri in 2012. 6. P Kunhikrishnan: He is the Mission Director for the launcher. From the Vikram Sarabhai Space Centre in Thiruvananthapuram, Kunhikrishnan has seven successful PSLV launches under his belt since 2009. He was appointed the mission director for the ninth time. He was responsible for seeing the rocket completes its mission successfully and that the satellite is correctly injected in the designated orbit. The challenge for him was that the orbital characteristic of the Mars Mission is different from regular PSLV missions. 7. Chandradathan: Took over as the Director of the Liquid Propulsion Systems Centre in 2013. He joined ISRO in 1972. Initially, he worked for the SLV-3 project during its design phase and later was involved in the development of solid propellant formulations for SLV-3. Over three decades, Chandradathan made contribution to the realisation of solid motors for sounding rockets, SLV-3, ASLV and PSLV. 8. AS Kiran Kumar: Joined ISRO in 1975, Kumar is the Director of Satellite Application Centre. He was responsible for designing and building three of the orbiter payloads - the Mars Colour Camera, Methane Sensor and Thermal Infrared Imaging Spectrometer. The challenge before him was miniaturising the components as the satellite does not provide much space. 9. MYS Prasad: He is the director of Satish Dhawan Space Centre and chairman of the Launch Authorisation Board. From 1975 to 1994, he worked in the launch vehicle development programmes of ISRO. He was part of the project Ttam of SLV-3, the first indigenously developed launch vehicle of India. As the launch was during northeast monsoon season the challenge was to enhance weather forecasting capability to 10 days and simultaneously carrying out preparatory work for Mars Mission while dismantling the GSLV rocket after the mission was aborted earlier this year. 10. S Arunan: He is the project director of Mangalyaan. Arunan was responsible for leading a team to build the spacecraft. The challenge for him was to build a new communication system, which would largely be autonomous so that it could take decision and 'wake up' the orbiter engine after 300 days. 11. B Jayakumar: The associate project director of PSLV project, Jayakumar was responsible for the rocket systems, testing till the final lift-off. 12. MS Pannirselvam: The chief general manager of range operation director at Sriharikota Rocket port, Pannirselvam was responsible for maintaining launch schedules without any slippages. 13. 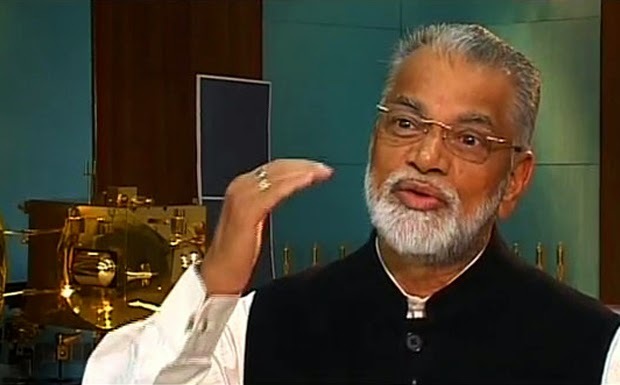 V Kesava Raju: He is the mission director of Mangalyaan. Raju and his team will track the journey of the MOM in the outer space. 14. V Koteswara Rao: He is the ISRO scientific secretary.